This is a grouping of (6) high quality “bath & body” products that we compiled based on previous seasonal purchases over the past (15) years. We are proud of what we have put together in this “Gift Box” selection, and we think you will agree with our selections. 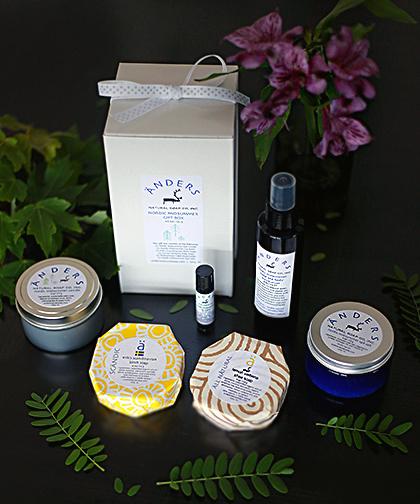 The Nordic Midsummer Gift Box is a culmination of some of our most popular “Summer Based” products. The box is a white gloss gift box with a bow tied around the box. The following products are enclosed: (1) Nordic Midsummer Spä Salt (crisp linen), (1) Nordic Midsummer Spä Candle (lemongrass & spearmint), (1) Nordic Midsummer Lip Balm (spearmint), (1) Erik&apos;s Scandinavian Birch Soap, (1) Lemon Verbena Shea Soap, and (1) Nordic Midsummer Hand & Body Moisturizer (lemon verbena). Organic Oils, Essential Oils, Dry Ingredients, etc. Our ingredients are all of the highest quality and can be found under the main product headings: Bar Soap, H&B Moisturizers, Lip Balms etc.